Back to the Speyside, and back to another distillery that does not have a visitor’s centre and one of the few, seemingly, that I did not at some point drive by: Dailuaine. It is owned by Diageo and, other than in the Flora & Fauna series, it sees no regular release. This is a shame—I’ve quite liked the few I’ve tasted and reviewed (two older ones—here and here—and this 12 yo). A decent number show up from the independents every year, though we don’t see very many in the US. This one was bottled by Gordon & Company—no relation to Gordon & MacPhail—a bottler I know nothing about. I bought these samples a long time ago; the whisky itself is long gone—and so these notes will have no utility to anyone. But being of no use to anyone is my core competency anyway. No, I don’t know what’s going on in the background of this photograph either. 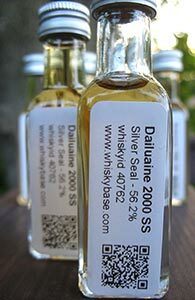 Another Dailuaine, this time from the very well-regarded Italian bottler, Silver Seal. Silver Seal’s bottlings are available in Europe–their bottles are shapely and their labels beautiful (especially on their older bottles); their prices, unfortunately, are very high and have gone up dramatically in the last year. This, I believe, is due to increased taxes in Italy. Still, while expensive they’re not Samaroli expensive. Then again, this is a 12 yo from a third or fourth tier distillery and the list price is €125…. 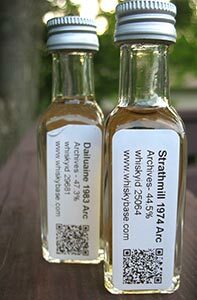 Thanks to Whiskybase’s excellent samples program, however, I was able to get two 20 ml bottles which is enough for a review. Tonight a quick look at two early releases from the Archives series of bottlings by Menno and CJ of Whiskybase. Their selections are always solid at a minimum and always fairly priced. The samples I am checking out tonight are of bottles from two Speyside distilleries that are not known for sending anyone’s pulse racing. The worst that can be said about Dailuaine is that it is one of Diageo’s workhorses–it rarely garners plaudits or brick-bats (I quite like the lone official release I’ve tried from Diageo’s Flora & Fauna range). Strathmill, on the other hand, is actively despised by many; but then so is Old Rhosdhu and I quite liked the one I tried a few nights ago. Let’s see if the signs from these samples are promising.